After only two weeks the hydroponics system is greening out. As are their root systems. Spring is coming early for the Green Team’s vegetables. The Green Team is happy (and relieved) to be able to say that the hydroponic system built, from scratch, is working as it is supposed to. Students are monitoring the system (checking water level, ph level and maintaining nutrients) and continuing to add the seedlings as they mature and are ready for the system. Their favorite thing to do is to visit the room to tell Mr. Weiss to look at how much the plants have grown. Mr. Weiss already knows…he obsessively watches over the Green Team’s “babies”. Hey Halsey family. Welcome back to school! 2018-2019 will be a great year for all of our families as Halsey JHS 157 has an exciting year planned ahead. We survived day 1 and all our students are adjusting to the new school year. For all our new families, my name is Mike Zevon. I am your Parent Coordinator and I am here for you if you have any concerns, questions, or just need to vent. I am a Sagittarius, I love the NY Yankees, I am a huge Star Wars and Marvel fan and I like long walks on the beach. KIDDING. I hate the beach. I will be sending out a weekly email to update you all on what is going on at Halsey – last week, this week and next week. I will also send other school related information throughout the week as it becomes available. The Stephen A. Halsey JHS 157 website is www.halsey157.org – check back there for updates. You can find all of our contact information listed under the staff directory on our website! The website is always being updated and some pages may be down or in the process of being updated. The calendar page was showing last years school calendar but that will be fixed shortly. Come on down and meet your children’s teachers! The fun starts at 5:30pm. The SHSAT Prep Classes that started in the spring, for last years 7th grade (on Saturdays) will be continuing for this years 8th grade students on Wednesdays and Thursdays after school from 2:30-4:30 pm. Students who did not participate in the Saturday program are not allowed to register for these classes. Only students who participated on Saturdays last year are allowed to continue in the program. The first day will be Wednesday, September 12th and will run from 2:30-5:30 PM (an extra hour due to testing). The remainder of the sessions will be from 2:30-4:30 pm and the last day will be Thursday, October 25th. Select Chorus auditions are on Monday, September 17th from 2:30-3:45 PM. If your child takes the yellow school bus home, please make sure there is someone who can pick them up, as they will miss the bus that day. Select Chorus is an advanced chorus group that performs at various in school and community events throughout the year. It is a competitive group, with about 30 seats open, and over 100 students that audition each year. The group is comprised of about 60 students from all grades and every talent. Students do not need to prepare anything for the audition. Students will be taught a piece of music from our upcoming concert, then will sing it back to Ms. Shikowitz in small groups. Aside from vocal quality, Ms. Shikowitz is looking for students who can learn the music quickly, sing in harmony with other students, blend well with other students while singing, follow along in the music, and are quiet and follow instructions during the audition. Select Chorus meets on Thursdays from September (first rehearsal 9/20) from 2:30-3:30, then on Fridays from 2:30-3:30 from February-May to accommodate for test prep. If you have questions, please email Ms. Shikowitz at sshikowitz@schools.nyc.gov. CITY OF SCIENCE is back! Please join the World Science Festival and Con Edison to explore this FREE, open to the public metropolis of larger-than-life interactive installations and hands-on activities. The event includes mind-blowing demonstrations, awe-inspiring experiments, apprentice programs, and guided tours of the College of Staten Island Astrophysical Observatory. Sunday, September 23 from 10:00 p.m. to 4:00 p.m. Check out the attached flyer. The PTA will be selling Spirit Wear beginning September 20th at the Back to School Night. You will be able to purchase t-shirts, sweat shirts, sweat pants, hoodies – both pullover and zip ups, shorts, and all kinds of fun stuff. You can use your Halsey Spirit wear in place of the gym uniform for gym class. The big mystery to start the year! What’s the deal with Pupil Path!?!?!? Pupil Path is in the process of being updated and will be made available on September 17th. Once we have it completely updated and ready for the roll out every student will receive an invitation letter with detailed instruction on how to register. It will be a piece of cake! The Citizenship Project is a FREE program to prepare legal permanent residents for the United States Citizenship and Immigration Services Exam (USCIS) naturalization test. Engage parents and strengthen community ties by bringing this grant-funded program into your neighborhood school. Courses take place on-site at the New-York Historical Society on Saturdays, weekday evenings, and weekday mornings. Morning, evening, and Saturday classes are offered at various locations across New York City. The registration forms for the Queens Community House All Starz Program are now available in Room 159. The staff are not available until 1pm so please have your child pick up the form after 1pm in room 159. All completed forms should be returned back to room 159 or placed in the Queens Community House mailbox in the main office. DO NOT RETURN THEM TO THE PARENT COORDINATOR! Good Day My Halsey Friends and Family! What a busy week we had here at your friendly neighborhood middle school. We had award ceremonies, yearbook distribution, yearbook signing, GRADUATION, year end trips for every grade to Adventureland, Great Adventure, Dave and Busters, and the Senior Trip to Dorney Park. Today’s update will just be a bunch of pics from the week that was. Our 6th and 7th grade students went to Adventureland in Farmingdale Long Island this week. The trips took place over 3 days – Wednesday, Thursday, and Friday. Mrs. McSparron organized this massive outting and did an OUTSTANDING job. Having to organize a trip for over 1000 students over the course of 3 days and have no issues is amazing and Mrs. McSparron should be commended for the time and energy she spent getting this trip done so the students could have a great time. THANK YOU MRS. MCSPARRON! Mrs. Lamere and Mrs. Quinones along with the yearbook committee have been working all year long organizing and planning out the yearbook for our 8th grade seniors. The yearbooks were distributed on Monday afternoon and the 8th graders were allowed to spend 7th period, 8th period, and afternoon homeroom with their friends and teachers in the school yard getting each other to sign. This past week we hosted our Award Ceremonies for the 6th, 7th, and 8th grade. 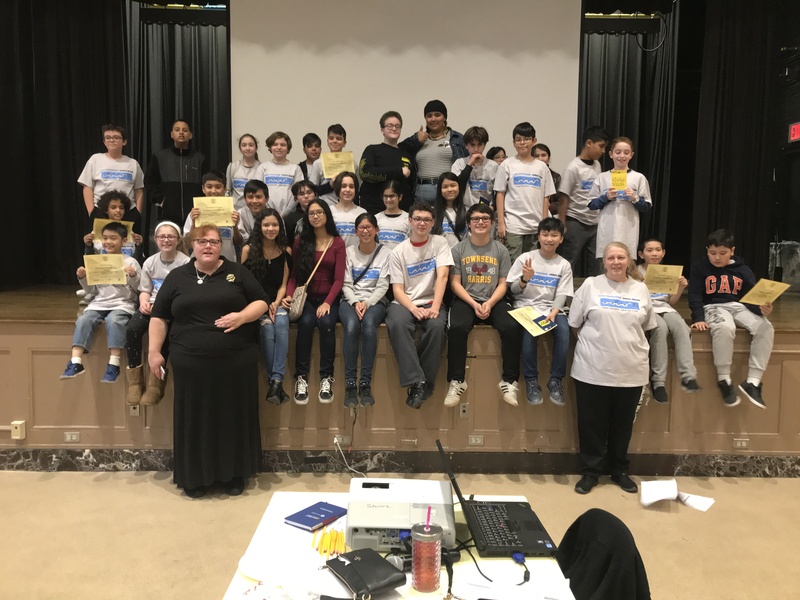 Student’s in the 8th grade were given awards for the achievement in different subjects and were recognized by their Guidance Counselors, Deans, Assistant Principals and Principal Suraci. Each grade had students inducted into the National Honor Society. 8th Grade Graduation was held at St. John’s University Lou Carnesseca Arena. The place was set up beautifully, the faculty there were extremely accommodating, and the event ran smooth. We were fortunate to have as our keynote speak Michael Nigro who starred in the Sound of Music Live and the upcoming movie titled YES – Based on Tim Realbuto’s critically acclaimed Off-Broadway play, YES tells the story of washed up child star Patrick Nolan who decides to mentor 18-year-old Jeremiah Rosenhaft. Mr. Nigro was introduced by the star of Disney’s movie titled Zombies, and a star of Sound of Music Live as well – Meg Donnelly. Thank you to one of our 8th grade parents Thommie Retter for helping make this a memorable moment for our students and families. It was amazing. Mr. Nigro did us the honor in singing “You Raise Me Up” with one of our students Lukas Galfano from class 807. Check it out below. Now is the time to celebrate the person who put the entire 8th grade activities together – the Award Ceremony, the Prom, Graduation and the Senior Trip – Ms. Sussman (on the left with Ms. Stimmel and Mr. Zevon). You know people have all kinds of things they deal with in their personal life and throw in the responsibility they take on as a professional its not easy. Ms. Sussman is an extraordinary individual. She put together and held together the 8th grade and their senior activities. I watched her go the entire year and a lesser person would have failed. She is an asset to this school, to our children here, and to the Forest Hills/Rego Park community. As parents we all have kids. Some have 1 like me. Some have 5. Some have 10. Ms. Sussman has over 600 here at Halsey and she treats every single one of them like they are her own children. She is a blessing to this school and to our students. She is also proof that no human being is perfect – she’s a Mets fan. Thank you Ms. Sussman. We love you very much! Thank you to Eileen Mullin for her work with the PTA and for updating all our social media pages and Web site. We would like to say thank you and farewell to our parents from our SLT and PTA who are leaving us this year. You will be missed dearly. The Parent Teacher Association is pleased to announce we are accepting letters of nomination for Officers of the PTA for the upcoming 2018-2019 school year. Eligibility for office is open to parents, guardians, or persons in a parental relation to a child currently at Halsey and attending for the 2018-2019 school year, and who are not employed at the school. Many parents in our school community work and have not been able to volunteer to help at our past fundraisers which have taken place at school during the day. We are hoping to get parent volunteers to help support selling snacks/concessions at the evening events below. You can volunteer to sign up for one or more dates! It’s pretty simple, all you have to do is be at the school on that date and man a table to sell drinks (water) and snacks and candy (various) during these events. If you can’t be there on these dates but can pickup and deliver to the school water and snacks, or have connections to get businesses to donate water bottles and snacks, that would be great also! This is also a great way your child (and their friends) can help volunteer and earn community service credits. NOTE: There MUST be one responsible adult present at each event since there is money transaction involved. Let us know if YOU can HELP! So I was thinking to myself “what will I do if we have a slow week and do not have much to report back on?” Then I realized that is impossible because something is always happening at Halsey JHS 157. We have an update on our Musical which takes place later in the school year, we have ELA and Math updates, Box Tops updates, Volleyball updates, PARENT SURVEYS, Leukemia and Lymphoma Society update, and so much more. This week I had the opportunity to sit in some meetings and see our Assistant Principals in action. I cannot tell you how amazing our faculty is. You will not find a stronger team of Assistant Principals than the ones we have here at Halsey with Mrs. Lisa, Mrs. Schiano, Mrs. Napolitano, and Mr. Dechongkit. You see that picture above? It is accurate. Each one of our AP’s and Principal is a Superhero. The amount of responsibility they have undertaken and the high level of performance they give back is admirable. Halsey JHS 157 and our students are truly blessed to have such an amazing leadership team. Survey administration opens on February 12, 2018 and runs through March 23, 2018. It is imperative that all parents complete the school survey once it is available. The results help us make the necessary changes the school and students need for the future. The Leukemia and Lymphoma Society Fundraiser (LLS) began this past Monday and you will not believe how amazing the Halsey Community is. Our school goal provided by LLS was $2,018. As of writing this we have raised over $4500 with about 2 weeks to go. The level of pride I have in our students, families, and faculty is tremendous. Everyone should be very proud of themselves. On Tuesday, February 13th 2018 Halsey will be hosting the Stuck for a Buck Day where students can donate a dollar to LLS and receive a piece of duct tape. If they donate $3 they will receive 3 pieces of duct tape and so forth. The students will be duct taping a couple of teachers to the wall after school! It is a fun way to raise money for the Leukemia and Lymphoma Society and the students will have a blast doing it. In order to facilitate this event in an orderly manner tickets will be sold to purchase the duct tape. Each grade will have a set day as to when they can purchase their tickets that they can turn in for the duct tape the day of the event. Its gonna be a lot of fun so make sure to send in some dollar bills with your children on February 13th! The PTA will be hosting a fundraiser next week. The Chocolate Lollipop and Bake Sale will take place on Monday, February 12th and Tuesday, February 13th during the students lunch periods. The lollipops are home baked and will cost $2 each.The lollipops will be distributed on Valentines Day – Wednesday, February 14th. The next PTA meeting will take place on Tuesday, February 13th at 7:00am. The next SLT meeting will take place on Wednesday, February 14th at 7:15am. ELA and Math Test Prep have begun this week. All students should have received their room assignments from their teachers already. If they have not received their room assignments please have them speak to their ELA and or Math teacher. Congratulations to classes 694, 794, and 994 for their outstanding play in the Adapted Phys-Ed Volleyball Tournament for District 28. They played against 5 other schools at MS. 74 in Bayside. The A-Team won the Gold Medal and the B-Team won Silver. We are very proud of them all. The results are in for Halsey’s Box Top Challenge! We collected over 3000 box tops school wide. Thanks to everyone who participated! A few of our Social Studies classes were visited on Friday by Alexander Hamilton Monaco. Hi Halsey Family. It has been a pretty quiet week. We do have a couple of things to update you on but I would like to start by taking a look back at an amazing 5 months here at Halsey. Our Principal Mr. Suraci has been instrumental in making sure Halsey JHS 157 and its students are engaged, prepared to tackle the challenge of education are thinking about empathy. Under his guidance we have been able to host a number of fundraisers and events to help the young people understand what empathy means – the ability to understand and share the feelings of another. Mr. Suraci has also stressed how important school pride and being involved in extra-curricular activities can be. Along with his Assistant Principals, Guidance Counselors, Deans, Teachers, School Aides, Secretaries, Custodians, Security, and even his Parent Coordinator, Halsey has been able to achieve a lot this year and set high standards for our school community. We hosted a Toy Drive raising 8 large garbage bags full of unopened new toys for the Hantz Family Foundation. We hosted a Food Drive collecting over 500 pounds of Food for the needy with City Harvest. We are raising money for the school using Box Tops and the Shoparoo App. Our Guidance Counselors worked with Mr. Suraci on our Respect for All week. The Spirit Wear sale which shows our school pride. Mr. Suraci worked with Councilwoman Karen Koslowitz to get the John Lennon Educational Tour Bus back at Halsey. AND Mr. Suraci will be chaperoning our Language Departments trip to Spain! 1. St. Jude Math-A-Thon – Our students will use math and help raise money for St. Jude Children’s Research Hospital. 2. Leukemia & Lymphoma Society – In honor of one of our 8th grade students will be raising money to help fight cancer. 3. Coat Drive – Coats can be donated and brought in to the collection box in the lobby by the auditorium. Throw in the daily grind of what a Principal needs to do and be on top of and we have one spectacular leader here at Halsey JHS 157…….And we still have 5 months left before the end of the school year! Nothing gets done without the guidance, support, and leadership of our Principal Mr. Suraci. Mr. Suraci would like to introduce everyone to the Halsey JHS 157 Bulldog MASCOT!!!! He does not have a name yet but will soon when we host a Mascot Naming Contest in the Spring! Send along any suggestions your children have for names and maybe it will win! The goal assigned to Halsey JHS 157 by the Leukemia and Lymphoma Soceity was $2,018 for the year 2018. Our fundraiser is due to begin on Monday, June 29th but we sent out all the materials and collection boxes early so we got a head start. We have already raised almost $1000!!!!!! KUDOS go out to Mrs. Forgione’s class 603 for raising over $300 so far and major PROPS go out to Mr. Sarris’ 723 class for raising over $200 so far. We even had two 8th grade students raise over $75 just by themselves within their own building. Those totals are just 2 classes and 2 students. I have not collected and counted over 40 boxes for this week yet. We are so proud of the students at Halsey JHS 157. Keep up the great work! For the second straight year Mr. Suraci brought in the Peer Mediation Program in collaboration with the NYC Commission for Human Rights. The focus of the program was to train students to be peer mediators and dispute resolution specialists, which would be a great addition to their school and community. Benefits of this program include the ability to resolve conflicts and prevent future disputes, cultivating life skills such as patience, persistence, active listening, and problem solving to increase self-esteem. By modeling effective alternatives to violence and threats, students promote greater tolerance, empathy, and understanding. The training process consisted of eight training sessions, with a graduation ceremony on the ninth week. Upon completion students were certified as peer mediators, and will be given the opportunity to serve as mediators in Halsey, should dispute resolution situations arise. The program facilitators were Mrs. Martello and Mr. Freydin. The ceremony was fantastic and seeing the young people displaying a sense of accomplishment and a willingness to help their fellow peers was truly a wonderful sight to see. To say we are proud of them is an understatement. We have to give so much credit to Mr. Freydin and Mrs. Martello as they guided the students through this 9 week process. We should all be proud of Mr. Freydin & Mrs. Martello and what they helped our students accomplish. Halsey was visited by one of our retired teachers – Mr. Elliot Berkowitz. Mr. Berkowitz was a Science teacher for 33 years here at Halsey. He shared so many great stories as he toured the school and remembered me from my days here as a student. On Saturday, Dec. 2nd, we held our annual Halsey Spring Hackathon. This year’s theme featured Animal Rescue/Wildlife Conservation! The students were given the task of creating a game or public service announcement to promote awareness of their topic. The students researched a variety of animals and found information on how various organizations help with rescue and rehabilitation. They created their programs in Scratch (http//:scratch.mit.edu) which is an introductory computer science/programming site that teaches students block programming, Students worked in groups throughout the day and presented their final projects at the end! Parents came to see the presentations and Alumni students from SEP came to help judge with out special guest, Ms. Lori Stahl Van-Brackle, our former SEP teacher. The day was a huge success! The 1st place winners will also have the opportunity to compete with the CS4ALL Hackleague and all groups will be eligible to submit their groups to Games 4 Change Student Challenge! For more information, contact Ms P Elfers @ pelfers@schools.nyc.gov Congratulations to all! !